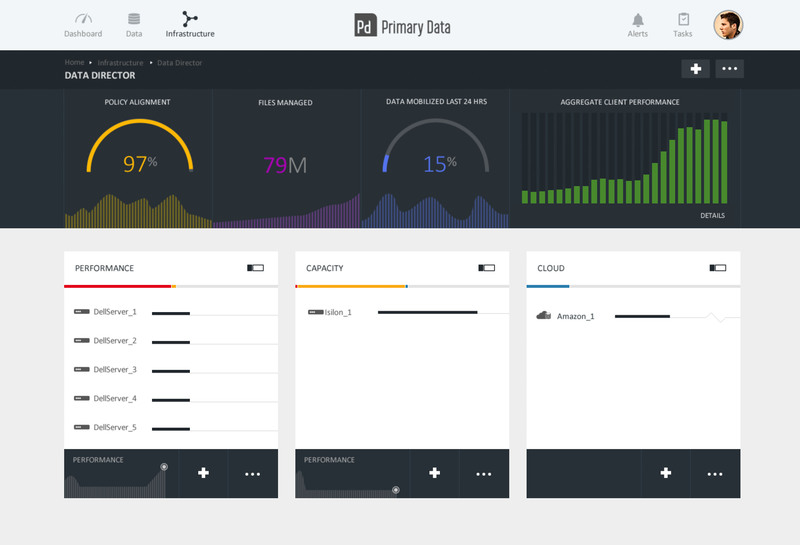 There’s a new storage startup out of stealth, called Primary Data and it’s implementing data (note, not storage) virtualization. They already have $60M in funding with some pretty highpowered talent from Fusion IO, namely David Flynn, Rick White and Steve Wozniak (the ‘Woz’) (also of Apple fame). There have been a number of attempts at creating a virtualization layers for data namely ViPR (See my post ViPR virtues, vexations but no storage virtualization) but Primary Data is taking a different tack to the problem. Essentially they want to separate the data plane from the control plane (See my Data Hypervisor post and comments for another view on this). 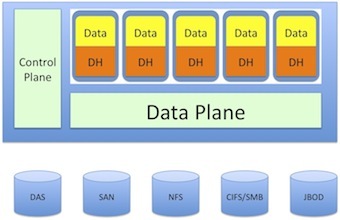 The data plane consists of those storage system activities that actually perform IO or read and writes. The control plane is those storage system activities that do everything else that has to be done by a storage system, including provisioning, monitoring, and managing the storage. Separating the data plane from the control plane offers a number of advantages. EMC ViPR does this but it’s data plane is either standard storage systems like VMAX, VNX, Isilon etc, or software defined storage solutions. Primary Data wants to do it all. Their meta data or control plane engine is called a Data Director which holds information about the data objects that are stored in the Primary Data system, runs a data policy management engine and handles data migration. Primary Data relies on purpose-built, Data Hypervisor (client) software that talks to Data Directors to understand where data objects reside and how to go about accessing them. But once the metadata information is transferred to the client SW, then IO activity can go directly between the host and the storage system in a protocol independent fashion. As I understand it this means that customers could use file storage, object storage or block storage to support any application requirement. This also means that file data (objects) could be migrated to block storage and still be accessed as file data. But the converse is also true, i.e., block data (objects) could be migrated to file storage and still be accessed as block data. You need to add object, DAS, PCIe flash and cloud storage to the mix to see where they are headed. Data objects can reside on Primary storage systems, external non-Primary data aware file or block storage systems, DAS, PCIe Flash, and even cloud storage. How does Data Virtualization compare to Storage Virtualization? Most storage virtualization solutions are in the middle of the data path and because of this have to be fairly significant, highly fault-tolerant solutions. Most storage virtualization solutions don’t have a separate and distinct meta-data engine. Most storage virtualization systems don’t require any special (data hypervisor) software running on hosts or clients. Most storage virtualization systems don’t support protocol independent access to data storage. Most storage virtualization systems support internal storage that resides directly inside the storage virtualization system hardware. Most storage virtualization systems support an internal DRAM cache layer which is used to speed up IO to internal and external storage and is in addition to any caching done at the external storage system level. Most storage virtualization systems only support external block storage. They both manage data migration in a non-disruptive fashion. They both support automated policy management over data placement, data protection, data performance, and other QoS attributes. They both support multiple vendors of external storage. They both can support different host access protocols. A policy engine runs in the Data Directors and provides SLAs for data objects. This would include performance attributes, protection attributes, security requirements and cost requirements. Presumably, policy specifications for data protection would include RAID level, erasure coding level and geographic dispersion. In Primary Data, backup becomes nothing more than object snapshots with different protection characteristics, like offsite full copy. Moreover, data object migration can be handled completely outboard and without causing data access disruption and on an automated policy basis. Primary Data will be initially deployed as an integrated data virtualization solution which includes an all flash NAS storage system and a standard NAS system. Over time, Primary Data will add non-Primary Data external storage and internal storage (DAS, SSD, PCIe Flash). The Data Policy Engine and Data Migrator functionality will be separately charged for software solutions. Data Directors are sold in pairs (active-passive) and can be non-disruptively upgraded. Storage (directors?) are also sold separately. Data Hypervisor (client) software is available for most styles of Linux, Openstack and coming for ESX. Windows SMB support is not split yet (control plane/data plane) but Primary data does support SMB. I believe the Data Hypervisor software will also be released in an upcoming version of the Linux kernel. They are currently in testing. No official date for GA but they did say they would announce pricing in 2015. Disclosure: We have done work for Primary Data over the past year. Attended SNWUSA this week in San Jose, It’s hard to see the show gradually change when you attend each one but it does seem that the end-user content and attendance is increasing proportionally. This should bode well for future SNWs. Although, there was always a good number of end users at the show but the bulk of the attendees in the past were from storage vendors. Another large storage vendor dropped their sponsorship. HDS no longer sponsors the show and the last large vendor still standing at the show is HP. Some of this is cyclical, perhaps the large vendors will come back for the spring show, next year in Orlando, Fl. But EMC, NetApp and IBM seemed to have pretty much dropped sponsorship for the last couple of shows at least. The best, new SSD startup had to be Skyera. A 48TB raw flash dual controller system supporting iSCSI block protocol and using real commercial grade MLC. The team at Skyera seem to be all ex-SandForce executives and technical people. Skyera’s team have designed a 1U box called the Skyhawk, with a phalanx of NAND chips, there own controller(s) and other logic as well. They support software compression and deduplication as well as a special designed RAID logic that claims to reduce extraneous write’s to something just over 1 for RAID 6, dual drive failure equivalent protection. Skyera’s underlying belief is that just as consumer HDAs took over from the big monster 14″ and 11″ disk drives in the 90’s sooner or later commercial NAND will take over from eMLC and SLC. And if one elects to stay with the eMLC and SLC technology you are destined to be one to two technology nodes behind. That is, commercial MLC (in USB sticks, SD cards etc) is currently manufactured with 19nm technology. The EMLC and SLC NAND technology is back at 24 or 25nm technology. But 80-90% of the NAND market is being driven by commercial MLC NAND. Skyera came out this past August. Coming in second place was Arkologic an all flash NAS box using SSD drives from multiple vendors. In their case a fully populated rack holds about 192TB (raw?) with an active-passive controller configuration. The main concern I have with this product is that all their metadata is held in UPS backed DRAM (??) and they have up to 128GB of DRAM in the controller. Arkologic’s main differentiation is supporting QOS on a file system basis and having some connection with a NIC vendor that can provide end to end QOS. The other thing they have is a new RAID-AS which is special designed for Flash. I just hope their USP is pretty hefty and they don’t sell it someplace where power is very flaky, because when that UPS gives out, kiss your data goodbye as your metadata is held nowhere else – at least that’s what they told me. There was more cloud stuff going on at the show. Talked to at least three or four cloud gateway providers. But the cloud startup of the show had to be Egnyte. They supply storage services that span cloud storage and on premises storage with an in band or out-of-band solution and provide file synchronization services for file sharing across multiple locations. They have some hooks into NetApp and other major storage vendor products that allows them to be out-of-band for these environments but would need to be inband for other storage systems. Seems an interesting solution that if succesful may help accelerate the adoption of cloud storage in the enterprise, as it makes transparent whether storage you access is local or in the cloud. How they deal with the response time differences is another question. The new technology showplace had a bunch of vendors some I had never heard of before but one that caught my eye was Actifio. They were at VMworld but I never got time to stop by. They seem to be taking another shot at storage virtualization. Only in this case rather than focusing on non-disruptive file migration they are taking on the task of doing a better job of point in time copies for iSCSI and FC attached storage. I assume they are in the middle of the data path in order to do this and they seem to be using copy-on-write technology for point-in-time snapshots. Not sure where this fits, but I suspect SME and maybe up to mid-range. Most enterprise vendors have solved these problems a long time ago but at the low end, it’s a little more variable. I wish them luck but although most customers use snapshots if their storage has it, those that don’t, seem unable to understand what they are missing. And then there’s the matter of being in the data path?! If there was a hybrid startup at the show I must have missed them. Did talk with Nimble Storage and they seem to be firing on all cylinders. Maybe someday we can do a deep dive on their technology. Tintri was there as well in the new technology showcase and we talked with them earlier this year at Storage Tech Field Day. The big news at the show was Microsoft purchasing StorSimple a cloud storage gateway/cache. Apparently StorSimple did a majority of their business with Microsoft’s Azure cloud storage and it seemed to make sense to everyone. The SNIA suite was hopping as usual and the venue seemed to work well. Although I would say the exhibit floor and lab area was a bit to big. But everything else seemed to work out fine. On Wednesday, the CIO from Dish talked about what it took to completely transform their IT environment from a management and leadership perspective. Seemed like an awful big risk but they were able to pull it off. All in all, SNW is still a great show to learn about storage technology at least from an end-user perspective. I just wish some more large vendors would return once again, but alas that seems to be a dream for now. With all this talk of software defined networking and server virtualization where does storage virtualization stand. I blogged about some problems with storage virtualization a week or so ago in my post on Storage Utilization is broke and this post takes it to the next level. Also I was at a financial analyst conference this week in Vail where I heard Mark Lewis of Tekrocket but formerly of EMC discuss the need for a data hypervisor to provide software defined storage. I now believe what we really need for true storage virtualization is a renewed focus on data hypervisor functionality. The data hypervisor would need both a control plane and a data plane in order to function properly. Ideally the control plane would set up the interface and routing for the data plane hardware and the server and/or backend storage would be none the wiser. I envision a scenario where a customer’s application data is packaged with a data hypervisor which runs on a commodity data switch hardware with data plane and control plane software running on it. Sort of creating (virtual) data machines or DMs. All enterprise and nowadays most midrange storage provide most of the functionality of a storage control plane such as defining units of storage, setting up physical to logical storage mapping, incorporating monitoring, and management of the physical storage layer, etc. So control planes are pervasive in today’s storage but proprietary. In addition most storage systems have data plane functionality which operates to connect a host IO request to the actual data which resides in backend storage or internal cache. But again although data planes are everywhere in storage today they are all proprietary to a specific vendor’s storage system. But in order to utilize a data hypervisor and create a more general purpose control plane layer, we need a more generic data plane layer that operates on commodity hardware. This is different from today’s SAN storage switches or DCB switches but similar in a some ways. The functions of the data switch/data plane layer would be to take routing instructions from the control plane layer and direct the server IO request to the proper storage unit using the data plane layer. Somewhere in this world view, probably at the data plane level it would introduce data protection services like RAID or other erasure coding schemes, point in time copy/clone services and replication services and other advanced storage features needed by enterprise storage today. Also it would need to provide some automated storage movement across and within tiers of physical storage and it would connect server storage interfaces at the front end to storage interfaces at the backend. Not unlike SAN or DCB switches but with much more advanced functionality. Ideally data switch storage interfaces could attach to dedicated JBOD, Flash arrays as well as systems using DAS storage. In addition, it would be nice if the data switch could talk to real storage arrays on SAN, IP/SANs or NFS&CIFS/SMB storage systems. The other thing one would like out of a data switch is support for a universal translator that would map one protocol to another, such as iSCSI to SAS, NFS to FC, or FC to NFS and any other combination, depending on the needs of the server and the storage in the configuration. Now if the data switch were built on top of commodity x86 hardware and software with the data switch as just a specialized application that would create the underpinnings for a true data hypervisor with a control and data plane that could be independent and use anybody’s storage. Assuming all this were available then we would have true storage virtualization. With these capabilities, storage could be repurposed on the fly, added to, subtracted from, and in general be a fungible commodity not unlike server processing MIPs under VMware or Hyper-V. 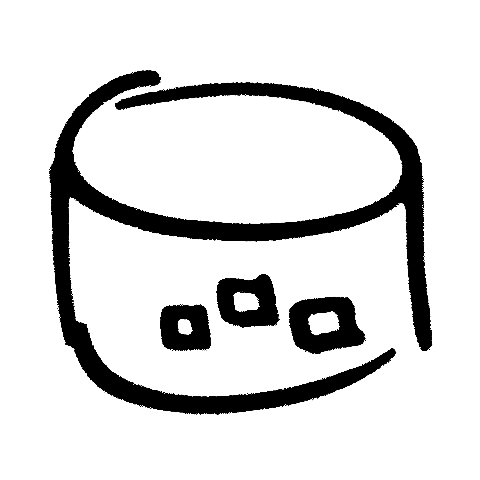 Application data would then needed to be packaged into a data machine which would offer all the host services required to support host data access. The data hypervisor would handle the linkages required to interface with the control and data layers. Applications could be configured to utilize available storage at ease and storage could grow, shrink or move to accommodate the required workload just as easily as VMs can be deployed today. Aside from the VMware, Citrix, Microsoft thrusts towards virtual storage there are plenty of storage virtualization solutions that can control most backend enterprise SAN storage. However, the problem with these solutions is that in general the execute only on a specific vendors hardware and don’t necessarily talk to DAS or JBOD storage. In addition, not all of the current generation storage virtualization solutions are unified. That is most of these today only talk FC, FCoE or iSCSI and don’t support NFS or CIFS/SMB. These don’t appear to be insurmountable obstacles and with proper allocation of R&D funding, could all be solved. However the more problematic is that none of these solutions operate on commodity hardware or commodity software. The hardware is probably the easiest to deal with. Today many enterprise storage systems are built ontop of x86 processor storage controllers. Albeit sometimes they incorporate specialized packaging for redundancy and high availability. The harder problem may be commodity software. Although the genesis for a few storage virtualization systems might come from BSD or other “commodity” software operating systems. They have been modified over the years to no longer represent anything that can run on standard off the shelf operating systems. Then again some storage virtualization systems started out with special home grown hardware and software. As such, converting these over to something more commodity oriented would be a major transition. But the challenge is how to get there from here and would anyone want to take this on. The other problem is that the value add that storage vendors supply currently would be somewhat eroded. Not unlike what happened to proprietary Unix systems with the advent of VMware. But this will not take place overnight and the company that takes this on and makes a go at it can have a significant software monopoly that would be hard to crack. Perhaps it will take a startup to do this but I believe the main enterprise storage vendors are best positioned to take this on. NexGen Storage a local storage company came out of stealth today and is also generally available. Their storage system has been in beta since April 2011 and is in use by a number of customers today. Their product uses DRAM caching, PCIe NAND flash, and nearline SAS drives to provide guaranteed QoS for LUN I/O. The system can provision IOP rate, bandwidth and (possibly) latency over a set of configured LUNs. Such provisioning can change using policy management on a time basis to support time-based tiering. Also, one can prioritize how important the QoS is for a LUN so that it could be guaranteed or could be sacrificed to support performance for other storage system LUNs. The NexGen storage provides a multi-tiered hybrid storage system that supports 10GBE iSCSI, and uses MLC NAND PCIe card to boost performance for SAS nearline drives. NexGen also supports data deduplication which is done during off-peak times to reduce data footprint. In a report by ARS Technica, a research group out of Stanford is attempting to gang together server DRAM to create a networked storage system. There have been a number of attempts to use DRAM as a storage system in the past but the Stanford group is going after it in a different way by aggregating together DRAM across a gaggle of servers. They are using standard disks or SSDs for backup purposes because DRAM is, of course, a volatile storage device but the intent is to keep all in memory to speed up performance. I was at SNW USA a couple of weeks ago talking to a Taiwanese company that was offering a DRAM storage accelerator device which also used DRAM as a storage service. Of course, Texas Memory Systems and others have had DRAM based storage for a while now. The cost for such devices was always pretty high but the performance was commensurate. In contrast, the Stanford group is trying to use commodity hardware (servers) with copious amounts of DRAM, to create a storage system. The article seems to imply that the system could take advantage of unused DRAM, sitting around your server farm. But, I find it hard to believe that. Most virtualized server environments today are running lean on memory and there shouldn’t be a lot of excess DRAM capacity hanging around. The other achilles heel of the Stanford DRAM storage is that it is highly dependent on low latency networking. Although Infiniband probably qualifies as low latency, it’s not low latency enough to support this systems IO workloads. As such, they believe they need even lower latency networking than Infiniband to make it work well. Speaking of PCIe NAND flash, OCZ just announced speedier storage, upping the random read IO rates up to 245K from the 230K IOPS offered in their previous PCIe NAND storage. Unclear what they did to boost this but, it’s entirely possible that they have optimized their NAND controller to support more random reads. OCZ’s been busy. Now that the enterprise is moving to adopt MLC and eMLC SSD storage, it seems time to introduce TLC (3-bits/cell) SSDs. With TLC, the price should come down a bit more (see chart in article), but the endurance should also suffer significantly. I suppose with the capacities available with TLC and enough over provisioning OCZ can make a storage device that would be reliable enough for certain applications at a more reasonable cost. I never thought I would see MLC in enterprise storage so, I suppose at some point even TLC makes sense, but I would be even more hesitant to jump on this bandwagon for awhile yet. Early last week Solid Fire, another local SSD startup obtained $25M in additional funding. Solid Fire, an all SSD storage system company, is still technically in beta but expect general availability near the end of the year. We haven’t talked about them before in RayOnStorage but they are focusing on cloud service providers with an all SSD solution which includes deduplication. I promise to talk about them some more when they reach GA. Finally, in the highend consumer space, LaCie just released a new SSD which attaches to servers/desktops using the new Apple-Intel Thunderbolt IO interface. Given the expense (~$900) for 128GB SSD, it seems a bit much but if you absolutely have to have the performance this may be the only way to go. Well that’s about all I could find on SSD and DRAM storage announcements. However, I am sure I missed a couple so if you know one I should have mentioned please comment. I was talking with a local start up called SolidFire the other day with an interesting twist on SSD storage. They were targeting cloud service providers with a scale-out, cluster based SSD iSCSI storage system. Apparently a portion of their team had come from Lefthand (now owned by HP) another local storage company and the rest came from Rackspace, a national cloud service provider. Their storage system is a scale-out cluster of storage nodes that can range from 3 to a theoretical maximum of 100 nodes (validated node count ?). Each node comes equipped with 2-2.4GHz, 6-core Intel processors and 10-300GB SSDs for a total of 3TB raw storage per node. Also they have 8GB of non-volatile DRAM for write buffering and 72GB read cache resident on each node. The system also uses 2-10GbE links for host to storage IO and inter-cluster communications and support iSCSI LUNs. There are another 2-1GigE links used for management communications. They are targeting cloud service providers and as such the management interface was designed from the start as a RESTful API but they also have a web GUI built out of their API. Cloud service providers will automate whatever they can and having a RESTful API seems like the right choice. The cluster supports 100K iSCSI LUNs and each LUN can have a QoS SLA associated with it. According to SolidFire one can specify a minimum/maximum/burst level for IOPS and a maximum or burst level for throughput at a LUN granularity. With LUN based QoS, one can divide cluster performance into many levels of support for multiple customers of a cloud provider. Given these unique QoS capabilities it should be relatively easy for cloud providers to support multiple customers on the same storage providing very fine grained multi-tennancy capabilities. This could potentially lead to system over commitment, but presumably they have some way to ascertain over commitment is near and not allowing this to occur. Data reliability is supplied through replication across nodes which they call Helix(tm) data protection. In this way if an SSD or node fails, it’s relatively easy to reconstruct the lost data onto another node’s SSD storage. Which is probably why the minimum number of nodes per cluster is set at 3. Aside from the QoS capabilities, the other interesting twist from a customer perspective is that they are trying to price an all-SSD storage solution at the $/GB of normal enterprise disk storage. They believe their node with 3TB raw SSD storage supports 12TB of “effective” data storage. Thin provisioned storage – which allows physical storage to be over subscribed and used to support multiple LUNs when space hasn’t completely been written over. Data compression – which searches for underlying redundancy in a chunk of data and compresses it out of the storage. Data deduplication – which searches multiple blocks and multiple LUNs to see what data is duplicated and eliminates duplicative data across blocks and LUNs. Space efficient snapshot and cloning – which allows users to take point-in-time copies which consume little space useful for backups and test-dev requirements. Tape data compression gets anywhere from 2:1 to 3:1 reduction in storage space for typical data loads. Whether SolidFire’s system can reach these numbers is another question. However, tape uses hardware compression and the traditional problem with software data compression is that it takes lots of processing power and/or time to perform it well. As such, SolidFire has configured their node hardware to dedicate a CPU core to each physical disk drive (2-6 core processors for 10 SSDs in a node). Deduplication savings are somewhat trickier to predict but ultimately depends on the data being stored in a system and the algorithm used to deduplicate it. For user home directories, typical deduplication levels of 25-40% are readily attainable. SolidFire stated that their deduplication algorithm is their own patented design and uses a small fixed block approach. The savings from thin provisioning ultimately depends on how much physical data is actually consumed on a storage LUN but in typical environments can save 10-30% of physical storage by pooling non-written or free storage across all the LUNs configured on a storage system. Space savings from point-in-time copies like snapshots and clones depends on data change rates and how long it’s been since a copy was made. But, with space efficient copies and a short period of existence, (used for backups or temporary copies in test-development environments) such copies should take little physical storage. Whether all of this can create a 4:1 multiplier for raw to effective data storage is another question but they also have a eScanner tool which can estimate savings one can achieve in their data center. Apparently the eScanner can be used by anyone to scan real customer LUNs and it will compute how much SolidFire storage will be required to support the scanned volumes. There are a few items left on their current road map to be delivered later, namely remote replication or mirroring. But for now this looks to be a pretty complete package of iSCSI storage functionality. SolidFire is currently signing up customers for Early Access but plan to go GA sometime around the end of the year. No pricing was disclosed at this time.